It is cold outside and “a grey wet haze” covers everything. In fact this is the coldest season of the year. Do you know which one it is? Now it is snowing and soon everything very will be covered with the wonderful white cold stuff. We will be able to build a snowman, have snowball fights, and go sledding and skiing. The landscape has changed a great deal and life for animals is very different. Some animals get through this season by hibernating. Others animals have to survive by eating what they can find in the wild, like holly and mistletoe berries. We humans do different things to stay warm and fed. What do we do? Winter is also a time for celebrations. There is Christmas and the New Year to look forward to with its accompanying festivities and gift giving. 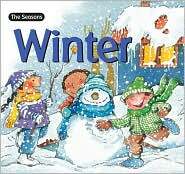 In this engaging little picture book the author and the illustrator not only provide their reader with plenty of information about winter, but they also ask their readers lots of questions, making this book interactive in nature. An activities section at the back of the book provides instructions on how to make a holiday greeting card, a snow star, a Christmas angel, and an advent calendar. There is also a “Guide for the parents” section which gives parents, teachers, and caregivers all kinds of ideas on how to further their children’s enjoyment and appreciation for the winter season.